White Sauvignon grapes have been grown in Alto Adige for more than a century. Here the mineral-rich soils (the result of ice age sedimentation) and the influence of the Eastern Alps, give this wine its intense, characteristic bouquet. An elegant frame and fine consistency. An excellent structure that is flavorsome and mineral, with a persistent palate. 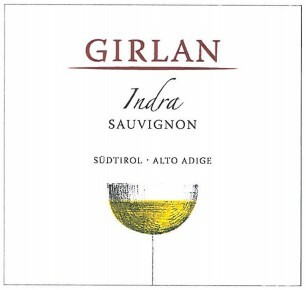 Indra Sauvignon will pair wonderfully with white-fleshed fish dishes, asparagus and other spring vegetables. The grapes are picked by hand at the peak of ripeness and placed in small containers to prevent excess pressure on the grapes. Gentle whole cluster pressing and clarification of the must by natural sedimentation. Fermentation in stainless steel tanks at a controlled temperature. Aging on the lees for 6 months in stainless steel tanks without malolatic fermentation.